Hugin also can do perspective corrections, but it’s probably too complicated for this simple use case. @Markus: If there is a KIO plugin to do that, then it should work. 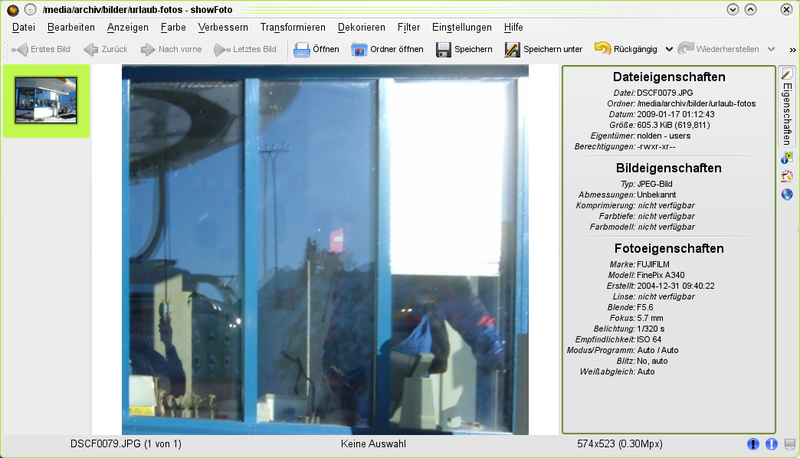 Possible that digikam/showfoto has some own code for this though. Wow – that folder preview is a really useful feature! I’m using the same feature we’ve got in Krita (although the usability is a bit limited) to straighten out pics I made from paintings in museums. You’re my hero! The work you do on KDevelop is amazing, and this rocks too! Yeah I think previewjob and thumbnail could need some love regarding optimisation. E.g. i’m not sure if we need the QImage -> Pixmap -> QImage conversion (see #ifndef USE_KINSTANCE). But it’s all a bit confusing, at least for me. I remember a discussion about the Images-in-folders stuff somewhere in a blog or mailing list. For the “inverse transformation”, very nice feature! But just from the name “inverse transformation” I would never think of cropping the image afterwards. How about naming it “crop image after transformation” or something like this? It’s a “perspective transformation”, and usually it’s used to apply a perspective on the picture. The inverse transformation of it does exactly the opposite: It removes the perspective, making it flat again. Thus the name “Inverse Transformation” matches it quite well. – The alignment of the previews within the folder has been done in a way to use as much space as possible (in the screenshots some previews are very tiny). Beside having not so tiny previews anymore, it also looks less cluttered now. The perspective correction sounds fantastic, I’ll have to give that a try too. The trouble is doing something like that would necessarily assume that the icon being used had that particular perspective. (1) this assumes the Oxygen theme is being used and (2) this means that if the oxygen theme is changed it would require the preview stuff to be changed separately. For a proper separation of theming I guess the icon theme should define a rectangle (or quadrilateral if you want to allow for skew) onto which previews could be painted. In fact I guess for SVG icons the best way to do it is to substitute some transparent element in the SVG with the preview and allow the SVG painter to do the rest. This would allow the theme to define exactly how the preview is painted (for example painting a photo sticking half-way out of a folder, or having it visible though a translucent folder). It’s nice but I actually like more how Vista provides those previews… You know inside the folders icon. It makes more sense since pages are in fact inside folder and not on it …. and AFAIK it isn’t limited just for pictures but works for docs and other files too …. That’s actually one of a few things about Vista that I consider good. @val-gaav: Yes it looks nice in Vista, but that’s purely cosmetic, and in the end you see less. Nice work, but I have to agree with val-gaav. When I saw the preview in Vista I really liked it. And I think that you actually see more in Vista. You don’t see the whole picture, that’s true, but you see part of it bigger. I don’t need to see exactly the whole picture to figure out which one it is, I just need to see it bigger and recognize somethiung in it. The theme icon is a major problem, though. I think this is a nice first step, but for me this feature is not done yet. @Firmo: So to you, a feature is done only when it is exactly like in Vista? Great..
To me, it is done. If someone else wants to improve it, fine. That would be mainly a job for theme designers, and would need an improved theming system. @vespas: That would only make sense if there was also some software that analyzes the image to detect interesting parts. Would be quite expensive though. @Burke: Should I feel sorry now? No, it is done when there are no apparent rooms for improvements. Right now we have another file manager which shows the preview in a prettier and better way (at least for some share of the user base, at least myself). Doesn’t matter if it’s the Microsoft way, the Apple way or the Gnome way. @Firmo: A Volkswagen is not as pretty as a Porsche, still it is a finished car. Unless you or someone else are planning to extend this, it is finished. A frame like the normal preview and black border for irregular image or something like that would be nice. Just add a black 3×4 ratio with 1px gray 30%, 1px gray 50% or 10% and one last 1px gray 30% around that black frame then draw the preview over it, it will do the job. I used it and currently it look really bad (but I am happy to have that feature). It doesn’t need to be a black background, but just something to make the 4 item less irregular, asymmetry is normally more eye catching than symmetry, and this is not a good thing this time. You don’t want the user to see only the preview and see irregularities. Just an opinion by the way, thank for both for this feature. Great work! Thank you very much for it! Nearly every application that does thumbnails allows to disable this, by disabling thumbnails for the mimetype “Directories”. 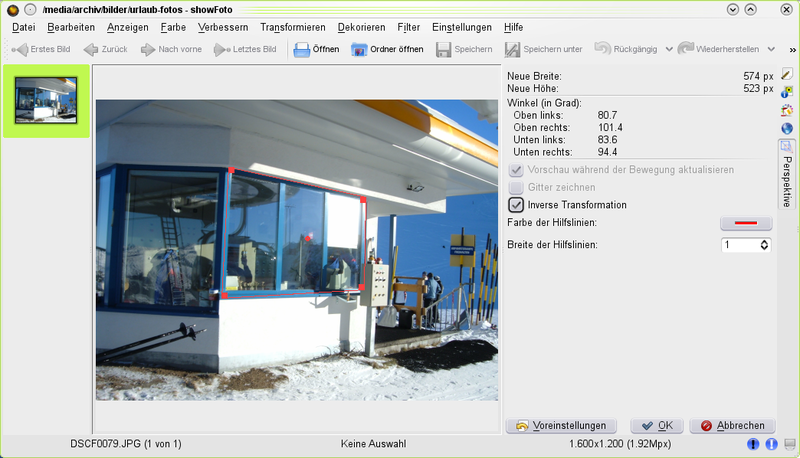 I did some tests with svn version of digiKam and it does great job. But one thing requires IMO more attention – it should be better in guessing of proportions of “unperspectived” fragment. Even in your example – you selected visibly rectangular area buy output is almost square. Thanks. @ywaz: Yes, it maybe could do a better job in this. But I think it’s not possible to reliably guess the real proportion, because you never know whether what parts of the proportion come from the perspective transformation, and what is part of the image. So it just takes the bounding-rect of the transformed version right now. Emmanuel Lepage Vallée: That’s wrong, human eyes are trained to recognize _regularities_, not _irregularities_. So the regular layout is a bigger problem than the irregularities in its content. Just a question regarding the folder-previews: would it be possible to add some sort of emblem showing whether the folder has sub-folders? I know quite a few people with sort of the same “organizing” behaviour as described above it would help immensly. Very nice. Like 4.2 a lot but hate some things, like some slowness and instability (in 4.2.0). Hope 4.3 comes more stable and faster and with more customizability (especially an option to disable virtual desktops changing while moving wheel (argh!!) someone did file a bug for it though). I just installed KDE 4.3 beta 2 on Kubuntu and the feature got integrated. Congrats and it’s a nice improvement. Unfortunately now all of my individually selected Icons per folder disappear if the folder contains an image. They flicker up shortly then they revert back 😦 I use a lot of individual icons for my folders in the home directory since they are easier to detect for my eyes. Does anyone have more information on this?